Cairns has a range of accommodations located in the central area, a short walk from the Convention Centre, and about 8km from the airport. Less expensive hotels tend to be further away from the Convention Centre. 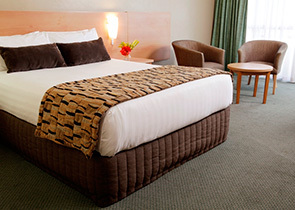 More details can be found in the Cairns Convention Centre Cairns & Region Accommodation Guide. You can also locate these hotels on the Cairns City Map. The following accommodation will be available to book via the online registration process. Special accommodation rates have been secured for delegates attending the Conference. To receive these special rates accommodation must be booked when registering online. All rates are per room per night unless otherwise specified and are in Australian dollars. Breakfast is not included in room rates. 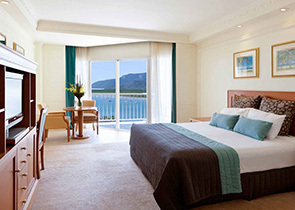 Enjoy 5-star Cairns accommodation in Tropical North Queensland. 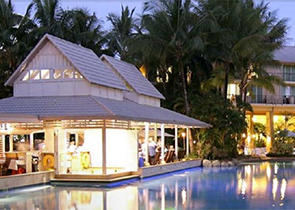 Swim in the tropical pools, enjoy a relaxing treatment in Vie Spa or dine on the best local seafood in Coco’ Restaurant. 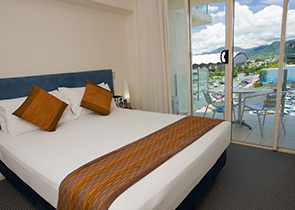 This hotel is located in the heart of Cairns CBD, and close to the departure point for daily trips to the Great Barrier Reef and other natural attractions. 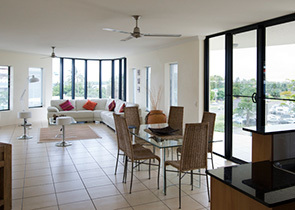 Park Regis City Quays invites you to discover Cairns and surrounds by providing the ultimate base during your visit. With the Esplanade, harbour foreshore, restaurants, shops, Night Markets, Reef Casino and Marlin Marina merely a short stroll away; you are close to everything that makes Cairns a great destination. Stay at Piermonde Apartments and explore Cains. At your doorstep you have the best of what Cairns has to offer including shops, restaurants, harbour foreshore, the Esplanade, Night Markets, Marlin Marina and Reef Casino. Centrally located in the heart of the city, within easy walking distance to the Reef Casino, Great Barrier Reef departure terminals, Esplanade Lagoon, Foreshore Promenade and Cairns Central shopping complex. Located in the city centre, Ibis Styles Cairns is just two blocks from the beautiful Esplanade and Lagoon pool, and 15 minute walk to the Cairns Convention Centre. The Civic Theatre, Night Markets, Reef Terminal, casino, cinemas, shops and entertainment are only a short walk away. 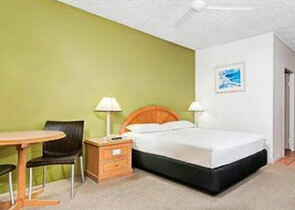 Hides Hotel Cairns offers affordable accommodation right in the heart of Cairns. It is surrounded by restaurants, pubs and shops and is only a short walk to the Casino, Reef Fleet Terminal, Esplanade Lagoon Pool, Cairns Central Shopping Centre and Kuranda Railway Station. Gilligan's is Australia's ultimate experience in budget backpacker hostel accommodation. Centrally located in the heart of Cairns, Gilligan’s is right next door to Rustys Market surrounded by various boutique shops, cafés and clubs. NOTE: Gillian’s accommodation is not available to book via the registration process. To book, please email reservations@gilligans.com.au and mention the International Conference on Photonic, Electronic and Atomic Collisions at the CCC in July 2017 to receive discounted rates. Beautiful tropical surroundings and contemporary style are waiting for you at Novotel Cairns Oasis Resort in Queensland, Australia. The convenient location offers guests easy access to the Cairns CBD, the award-winning Cairns Esplanade and the most popular attractions and activities in the city centre. To receive the special accommodation rates, bookings must be made via Conference Logistics and not with the hotels directly. Please note that accommodation rates offered directly through the hotel or other websites may vary. Online bookings through the conference website are a guaranteed rate and reservation. Accommodation is available for the dates IN: 25/07/2017 - OUT: 1/08/2017, but may be organised outside of these dates on a 'request' only basis. If you require accommodation outside of the available dates, please select the dates that the system allows and make a note in the Special Requirements field of the additional dates you require. The closing date for accommodation bookings is 23 June 2017. Bookings made after this date will be subject to availability. All rates are per room, per night and do not include breakfast. No booking will be confirmed without a credit card guarantee or a pre-payment. Any incidental expenses incurred during your stay (for example: mini bar, telephone or dry cleaning) must be paid for by yourself on check out. Delegates are responsible for paying the balance of their account and all incidentals on departure from the hotel. The hotel will be responsible for issuing tax invoices for accommodation payments upon departure. All amendments to your accommodation booking MUST be made in writing to Conference Logistics and not directly with the hotel. Any changes must be advised by 23 June 2017. All cancellations MUST be made in writing to Conference Logistics. Cancellations received after 23 June 2017 will be charged by the hotel according to their cancellation policy. Standard hotel check-in time is 2pm, but individual hotels may differ. If you are to arrive before this time it is probable that you will not be able to gain access to your room. To guarantee a room to be available for an early arrival you will need to pre-book your room for the previous night. If required, please indicate on your registration form. (You will be charged by the hotel for the additional night).